We sadly report that Joanne, the wife of television veteran John Crilly, has passed away after a long and courageous battle with illness. We were first alerted to this by Janine Vidot at Seven Perth. Kevin Campbell pointed out that she was a wonderful battler for life after not fully recovering from surgery to then survive under duress for many years. Greg Byrne not only pointed this out, but also that John really loved her so much. It was Kevin she went to Melbourne to talk John into coming to TVW from GTV and said Jo was most supportive of the move. John Crilly has had a remarkable career in the industry with an involvement in numerous key shows over those years. John started as a stage hand on Graham Kennedy’s “In Melbourne Tonight” show in 1959 and remained there until joining Nine Perth as the Production Manager. He was there for six Appealathons for STW Channel 9. John was then drawn into Kerry Packer’s World Series Cricket (1977-79) as a television director before becoming GTV’s Head of Production in 1984/85. He eventually joined TVW and did a great job in keeping the station in production at a time when there was a trend towards greater centralisation and networking. John eventually went freelance with JC Media Productions, whilst maintaining a link with Seven Perth by producing the Christmas Pageant and annual Telethon. John Crilly worked on Telethon for 27 years and had a total of 34 years involvement with such appeals at Seven, STW9 and GTV9. Our heart felt commiserations go to John Crilly on the sad loss of his wife and partner over those many years they shared of Australian television history. The Funeral for the late Mrs Joanne Crilly of Karrinyup will assemble at the East Chapel in PINNAROO VALLEY Memorial Park, Whitfords Avenue, Padbury for a Cremation Service to commence at 2.30pm on TUESDAY (21.07.2015). Kim Lesouef: Sorry to hear about his wife! John was an inspirational man to work with. He is so talented. Lesley Bradford: Oh that’s dreadful. I remember going to an Eagles auction and it was their anniversary the same day. He bought Joanne a vacuum cleaner! We told him off and called him Mr Hoover all night and the next week at work. I offer my deepest sympathy to John and the boys. Adrian Chambers: Thoughts are with you, John. Peter Wharram: Sorry for your loss John..
Murray Korff: Very sad news. She fought a long and difficult fight. Condolences from Jan and me John. Russell Goodrick: Sad news . Our prayers are with you ! Mike Voss: Very sad John, condolences may she rest in peace. Ray Wardrop: Thoughts for Crills and his family. Lionel Yorke: John, my thoughts are with u & family on the sad news of your beautiful wife Jo, we all go back a long time! Di Ingelse: Sincère condolences to John and the boys. Nic Nolan: Sorry to hear that. Condolences to John and family. Bob Finkle: Very sad news. John our thoughts are with you and family. Keith Spice: Sincere condolences to you and your family John. Howard Sattler: Condolences from all of us for Crills, one of the industry’s true great gentlemen. Cindy Dean Antulov: Thinking of dear John Crilly on his sad loss. Anne Yardley: My thoughts go out to John, Ben and Luke. Such a tragic loss. 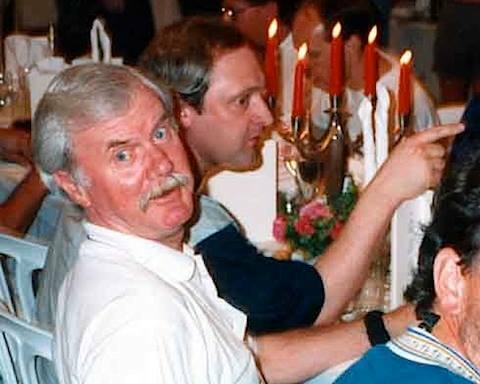 David Christison: Thinking of you at this sad time old mate. Ian Seaton: So sad to here this news John. My thoughts are with you and your boys. Have great memories of you and Jo. Ian Jobsz: So sorry for your loss John… Like Seats, I have great memories of our time together at STW… Stay strong mate.. Regards. Chris Rapoff: Deepest sympathies to you and the family John. Thoughts go out at this sad time. 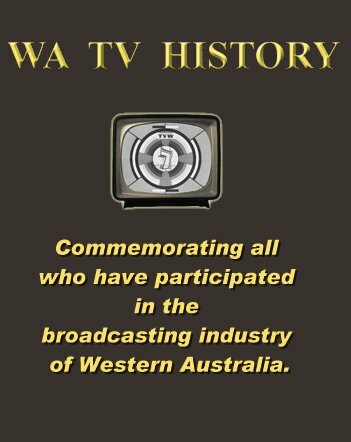 The WA TV History Public Facebook page (Click Here). Comments from Members of the broadcasting fraternity (Click Here). Our deepest sympathy to husband John and sons Ben and Luke on the loss of such a beautiful and extraordinary person taken from us, but we know her infectious smile and laughter is now lighting up Heaven. Our deepest sympathies to John and family. Our thoughts and best wishes are with you at this sad time. 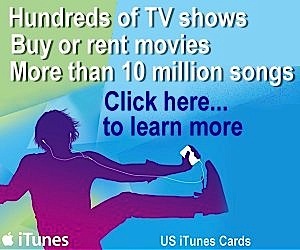 From all your friends at Channel 7 and Telethon. CRILLY (Joanne):Treasured memories of a true friend. Always caring for others and somehow smiling and courageous through the endless pain. Heartfelt sympathy to John and our Godsons Ben and Luke. CRILLY (Joanne):The flame of life has been extinguished, the long and courageous battle over but the countless years with memories of laughter, joy, fellowship and selfless generosity will never ever be forgotten. R.I.P. JoJo. Gabrielle and Bill Beams. CRILLY (Joanne ): Sincere sympathy to John, Ben and Luke on the sad loss of your loving wife and Mum. Heartfelt sympathy to John, Ben and Luke on the sad passing of a beautiful lady. May she now rest at peace. Love and thoughts are with you.